Plants come with a myriad of benefits, whether they are in fashion or not. If you live in dry areas, the added humidity brought to you by indoor plants can help fight illnesses and conditions such as dry skin. In essence, plants keep the air clean and purified, and certain plants can filter common toxins such as formaldehyde which is found in carpets, and benzene found in many household items. When it comes to air, plants function in reverse to humans. Plants photosynthesize, which means they absorb carbon dioxide and release oxygen, while humans need to breathe oxygen and release carbon dioxide. It seems logical that plants and humans are meant to live together, even in an urban apartment. Apart from this, they can be beautiful decor. 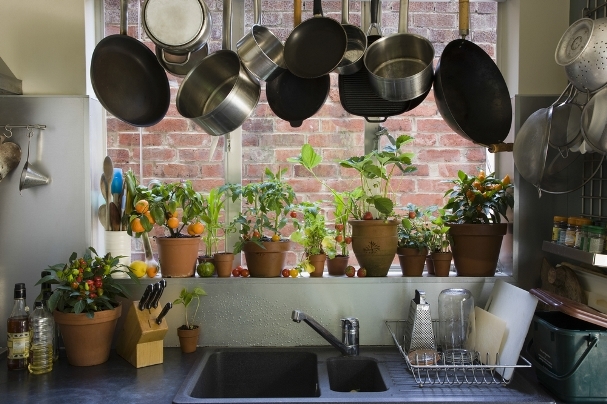 If you live in a small and particularly stuffy apartment, consider getting the right sort of plant for your needs and lifestyle. Likewise, if you have more space and plenty of sunlight, your options can be different. Although it is good to consider your living conditions before picking out the right plant, the plants you choose for your apartment should, at the end of the day, depend on your personality and lifestyle. Certain plants require a lot of commitment and attention, while other, more resilient plants can withstand a good amount of neglect before they start showing any signs. The ideal hanging plant, the pothos is most revered for its purifying qualities. It’s quite adaptive to different lighting conditions, too, but is naturally attracted to direct light. This kind of plant is great for busybodies who just can’t be worrying about their plants all the time. Snake plants can sustain a good amount of oversight and do best in low light and little water. They are known for their abilities to purify the air from formaldehyde and benzene. 3. Cacti – Cactaceae sp. Cacti come in many odd shapes which makes them a really fun and quirky addition to any apartment. Super easy to care for, all you need is a pot and a windowsill to show love to these babies. Bamboo is beautiful – and low maintenance too! However, it’s not technically bamboo. What is known as lucky bamboo is actually a type of dracaena and not a bamboo at all, and it requires a low amount of light to thrive. It won’t grow in darkness, but direct light won’t do it good either. In addition, it will upgrade your Feng Shui. Trendy and cute, succulents are great for apartments. They’re very resilient, and only require water every other month. These plants can grow big and all over the place, which is why they’re also known as airplane plant. They’re also easy to multiply and do well in low light purifying your home. A symbol of intellectual achievement in ancient Rome, this strikingly familiar plant is often used for decoration, especially during Christmas. Even if you opt for low-maintenance and resilient indoor plants for your pad, there are some precautions you should take and factors you should consider before picking out the right plant. If you have pets, for instance, it is important to check whether your plant is safe for your species of pet. Even if your plant is completely pet-friendly, this doesn’t guarantee that your companion will take a liking to it. In addition, if you live in a hot and humid place and make use of air conditioning units and air purifiers, consider the effect this might have on certain types of plants. If possible, avoid putting plants right underneath an AC or fan to avoid drying. Think of the aesthetic appeal of the plants you pick. Indoor plants can really change the appearance of your apartment, so structure them wisely. Don’t crowd small tables with big plants – place them in larger empty corners instead. Once you’ve picked the right spot for your plants, try to stick to them, since moving your plants too much can shock and disturb them. Most importantly, after your research is done, enjoy your plants and the fresher air and fresher look they will bring to your apartment.